Mopping systems reduce splashing with high efficiency wringers. Side press wringer exceeds 50,000 wringing cycles. Down press wringer exceeds 100,000 wringing cycles. Premium tubular steel and structural web molded plastic. 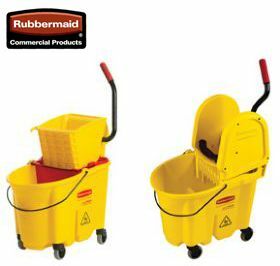 WaveBrakeÂ® Mopping Systems are yellow and the optional Dirty Water Buckets are Red. FOB Shipping Point. Product No. Description Size L x W x H Cap. (qts.) Wt. (lbs.) Price Ea.